A mix of dried vine fruits and mixed candied peel, ready to use in baking recipes. A mix of dried vine fruits and mixed candied peel. A mix of dried fruits, ready to use in baking recipes. 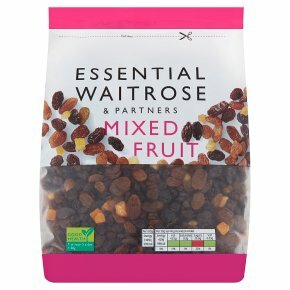 INGREDIENTS: sultanas, currants, raisins, wheat glucose syrup, orange peel, lemon peel, sunflower oil, sugar, acidity regulator (citric acid), preservative (sulphur dioxide).